JR. and I will be there Saturday, 4WD Buggy (2) Both of us, and one 4WD Short Course. Hiya Hopper, I would like to reserve a full table, Table #6 please, and I will pay you Saturday morning. Thanks. Donnie I will move you guys to table 2 thx. Track looks fun. Let the derby begin. Jason check out the drawing I made. The pit tables are there. We will have the same amount of pit tables overall. You guys can come by the shop or call to pay for the reservation. If you can not make it before Friday please pay saturday morning. Hey hopper, I want table 11 or 12 please. Thanks and I will shoot you a text also. 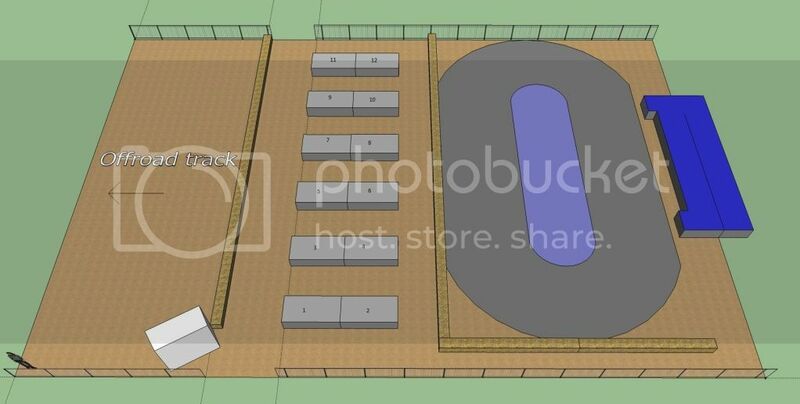 Oval track in the arena??? How will that affect pitting spaces? There will be 12 tables that you could possibly reserve. I have numbered them in this picture but in case they are hard to see the tables start at #1 at the bottom left and end up at #12 on the top right. The tables will be 4x8 and each table will be butted up against another one. There will be 6ft in between each row of tables. If this is not enough room for you then I suggest that you bring your own tables so you can take as much room as you'd like. I will do my best to post here which spots are still available. I had a request earlier for table #1 for the electric series (Seabass). It may be a good idea to let me know a couple different table numbers in case the one you want is taken. Track is finished! No word on possible Friday practice. Track runs clockwise. Huge thanks to those that were able to come out and help this week! Yes there is usually plenty of room to bring your own. Either way you should bring an extension cord and power strip as well. Also any of our tables that are not reserved are open on a first come first served basis. Hopper will there be room to bring our own tables? I have had a few racers inquire about reserving pit tables again for the winter series. We will do it again same as last year. 1/2 table is $75 and a full table will be $100. Tables are reserved for either the nitro or electric winter series, not for both. Anyone intetested in reserving a table should call the shop or better yet email me at hopper99@comcast net. Please include which series you want it for and where you would like to pit. I will post a diagram of what the pits will look like asap. The layout will be different from last year. Payment for the tables can be made in the shop or on sat morning at the track. Any questions please let me know. I fill them just so the cross pins are under the diff fluid. just got a losi scte and im putting in different diff fluid how much fluid do i put in the case anyone? Im in for Open 2wd Buggy and Open 4wd Buggy..
Whos racing Open 2wd Buggy Sat?